The only exposure to goats the average North American has had is perhaps a few pets at a petting zoo and fabled bedtime stories. It’s not uncommon for most folks to have a difficult time envisioning the art of target browsing, when I describe a site of a few hundred goats with no fences and a few herding and guardian dogs. For most of our clients, seeing is believing, and the intensive process of target browsing is only executed by a skilled land-steward. Targeted browsing is the best form of plant management because its the only form that provides; reduced liability, organic solutions that are beneficial to the earth, increases soil productivity and has a positive public perception. The strategy doesn’t use fences and the goats are never left alone. Goats are browsers which means unlike sheep, cattle and horses, goats prefer broad-leaved and woody plants to grasses. Some cattle have been taught to eat some weeds but not enough to be a viable weed solution. For thousands of years Shepherds have utilized goats to clear agricultural lands. the goats moving and targeted on the invasive plants. sensitive natural areas. Many toxic chemicals have been found to cause Autism, Infertility, Alzheimer’s & Cancer. Pesticides and herbicides accumulate in soils, adsorb to the soil and are often water-soluble. Toxic chemicals become more concentrated over the summer as they have a long half-life and are re-applied to plants. Toxic chemicals can migrate off-site, contaminate water and every time they are used an inherent amount of exposure and liability is assumed. Target browsing reduces overall duration and cost of plant management programs because target browsing promotes natural succession. While the initial treatment and eradication of invasive plants is relatively the same timeline, there is far less disturbance to the site soils and no need to amend soils. Nutrients are still available for native plants to compete with invasive weeds. Shortening the timeframe of overall site management. The costs of target browsing are significantly less than other methods. Several studies show target browsing with goats reduces weeds by 95%. Target browsing will not damage soil and you won’t need soil amendments. Countless studies show that the adsorption of herbicides interferes with the cation ion exchange in soils and causes leachates of metals and nutrients from soils which impact water and prevent nutrients from getting to other plants. Soil pH changes after 2 applications of herbicides and facilitates further weed infestations. When chemicals are used in agricultural areas and parks, where preferred vegetation is wanted, amendments must be made to the soil. Goats stomachs are so acidic they actually destroy weed seeds and prevent seed distribution, they can also digest weeds that would otherwise be toxic to other livestock. If not timed perfectly right, mowers can actually distribute seeds and chemical spraying can trigger a reproduction response in plants, where the dying plants put their last reserve of energy into seed production and make the problem worse. down nutrients that are trapped in weeds and fibrous material and make it readily available for desired plants. Goat manure has a healthy N-P-K ratio and has been proven in several studies to not be a concern for smell or nutrient overloading with short application rates. like; water bodies, parks, hospitals, organic farms and markets. 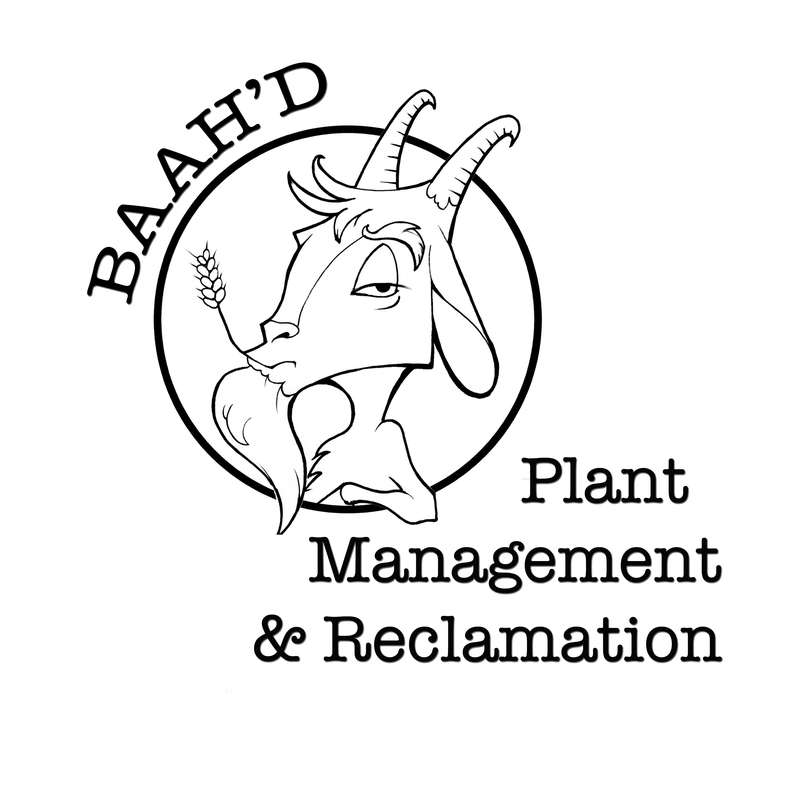 Goats are safe to use in riparian areas and won’t damage fragile plants and soil like cattle do. Goats do not compete with wildlife but enhance forages. So what weeds will a goat eat? There are times of the years that some plants might taste bad. The consultation will determine which plants we are targeting and when we should be on-site. We haven’t seen it yet but in rare cases very large amounts of one type of weed may be too much for the goats systems. We take a break mid day to get out of the heat and dilute the goats bellies with hay and other vegetation. Each goat has its own personality and preference. Some may not like certain plants while others love them. That’s why we are there, it’s really up to the goats so nothing is completely guaranteed. Goats are always exploring and trying new things, here’s a list of what we have seen them eat so far. There are about 126 species our herd eats reliably. If you see something on the list you want to keep don’t worry, we keep them moving off the favorable vegetation. Don’t see something on here you want to manage, give us a call and we can always try it.